The DS-8 Clone Drum Synth is one of our favorite new circuits. 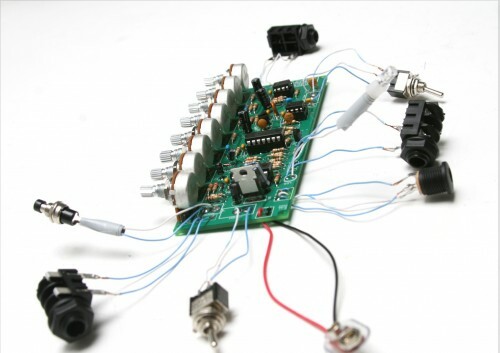 There is a lot of sonic potential and functionality built into the circuit. 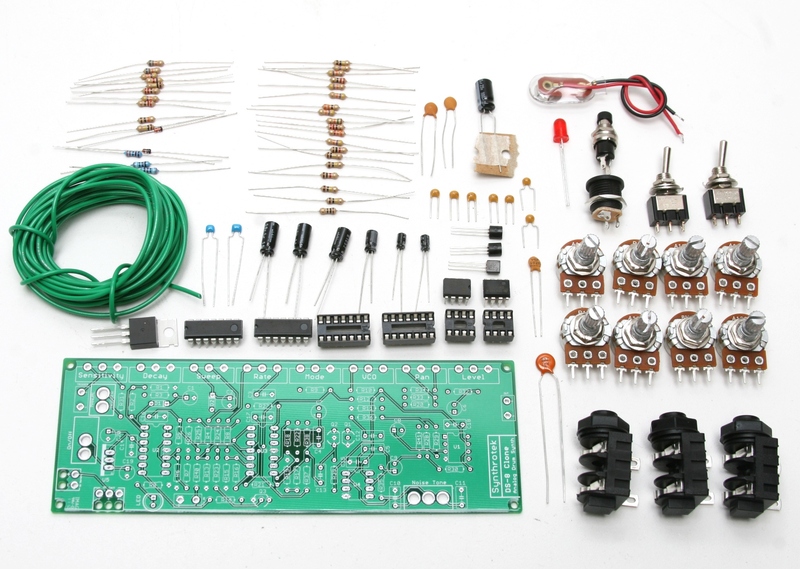 If the Drum Synth is your first build, don’t worry about this project being difficult; despite the number of components, the build process is fairly straightforward. Check your kit to make sure you have everything you need to finish the circuit. If you’re unfamiliar with electronic components, don’t worry; the pictures are great guides to help you identify the similar components. If you’re missing anything from your kit, please send us an email and we’ll get it out to you ASAP. Alright, on to the build. The first components in our build are soldered directly to the PCB. This helps keep the working area compact and wire-free. 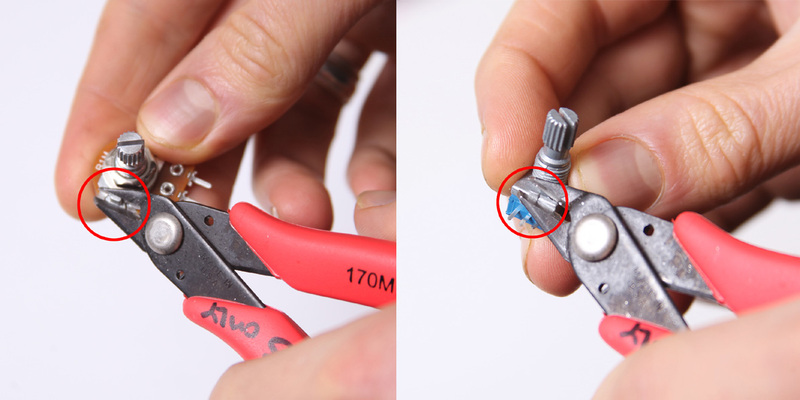 If you make a mistake and have to resolder a component, you will be able to do so without a wire getting in the way of your solder iron. Place the 4 IC sockets on the PCB and solder as shown in the picture. Note the cut-outs and dots on the body of the ICs; these identify where pin 1 is located and how the socket should be placed. If you are in doubt, double-check the picture. The DS-8 Clone circuit has a lot of resistors. I suggest inserting half into the PCB and then soldering them, clipping the leads, and repeating for the other half. If the resistors are becoming tangled with each other, simply solder what you have and then move on to more. Insert the capacitors according to their reference ID. For the electrolytic capacitors, pay attention to the polarity markings on both the capacitor body and the PCB. Electrolytic capacitors have a colored band and a shorter lead to denote the negative pole. The square through-hole on the PCB has a silkscreen ‘+’ to denote positve polarity. Q1, Q2, and Q3 are easy to insert correctly because of the silkscreen on the top layer of the PCB. You may need to spread the leads outward slightly in order to get the transistor to fit. You should leave a little room between the bottom of the transistor and the PCB. For the potentiometers, you have a couple of options based on how you plan to mount your circuit. 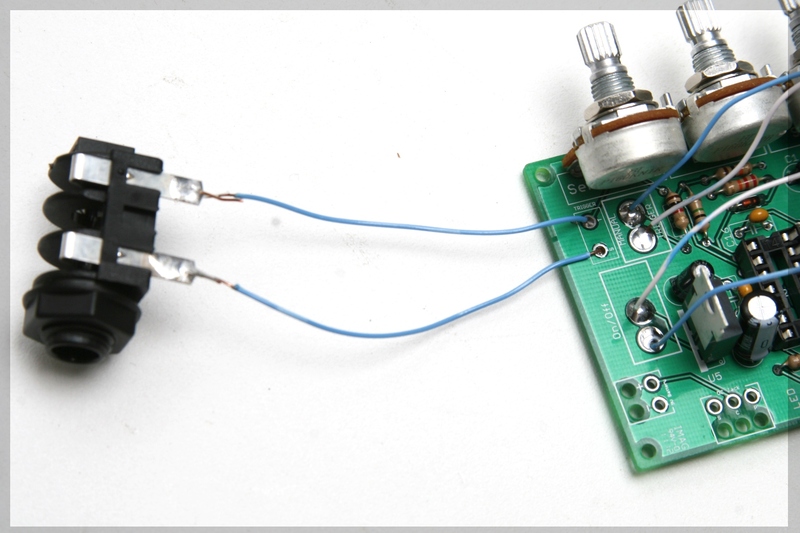 The board layout allows you to directly mount the potentiometers to the PCB or you can attach wires to them to extend their reach. Remember that longer wires can always be cut and you’ll save yourself some frustration and extra work. 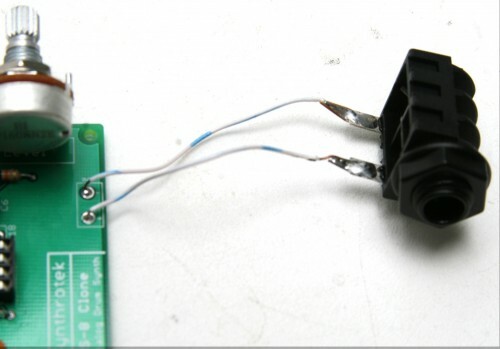 For this portion of the build instructions, the remaining components will be attached to the PCB via wires. 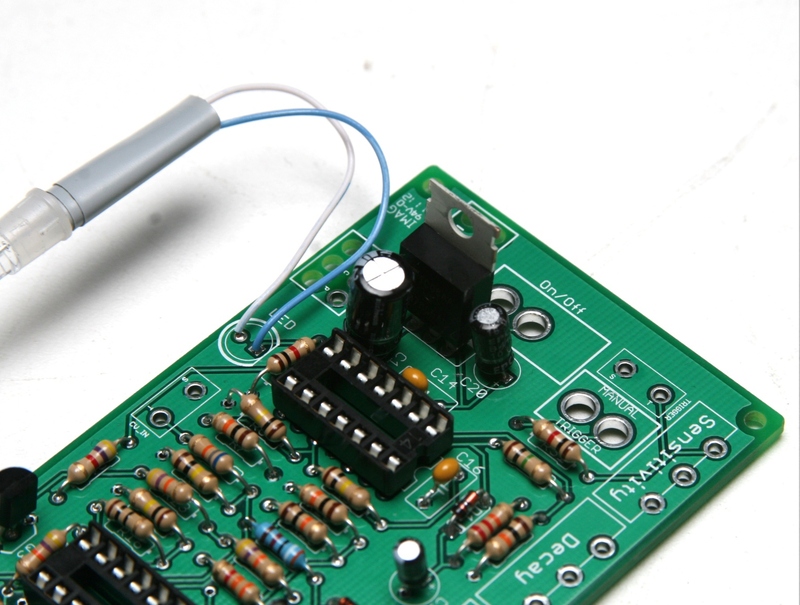 Keep in mind how you are going to mount your circuit’s components. You can also mount your components in your case and wire them to the PCB. Either way is fine, but troubleshooting a non-functional circuit that is already mounted may require you to poke around tight spaces with a soldering iron (not fun!!!). The next two wired components are the two switches. The SPST switch (SW2) has two terminals and it does not matter how they are attached to the PCB. The SPDT switch (SW1) needs only the center solder terminal to be inserted into the middle PCB through-hole (shown as the red wire in the picture below). You can insert the remaining wires into either through-hole and it will work. The switch’s toggle determines which capacitor (C10 or C11) will be used to color the noise portion of the circuit. 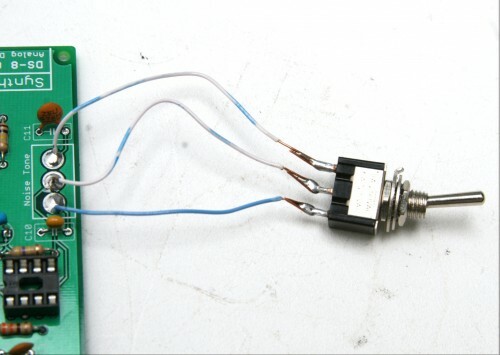 Included in your kit are three 1/4″ mono switched jacks. 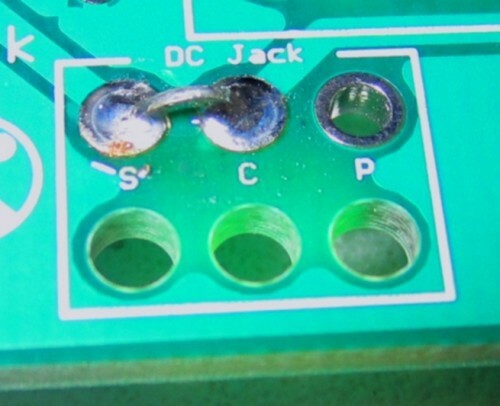 If you have never used these types of jacks, the number of solder terminals may be confusing. You will only be using two, but there are upcoming mods you can perform that will expand the circuit’s potential beyond just the standard Drum Synth sound. So, with the jack’s opening facing towards you, solder two wires to the terminals on the left. The one closest to you (shown as blue wire in the picture) will attach to the ‘-‘ PCB position. Solder the remaining wire (red) to the ‘+’ position. Last but most important are the power connectors. 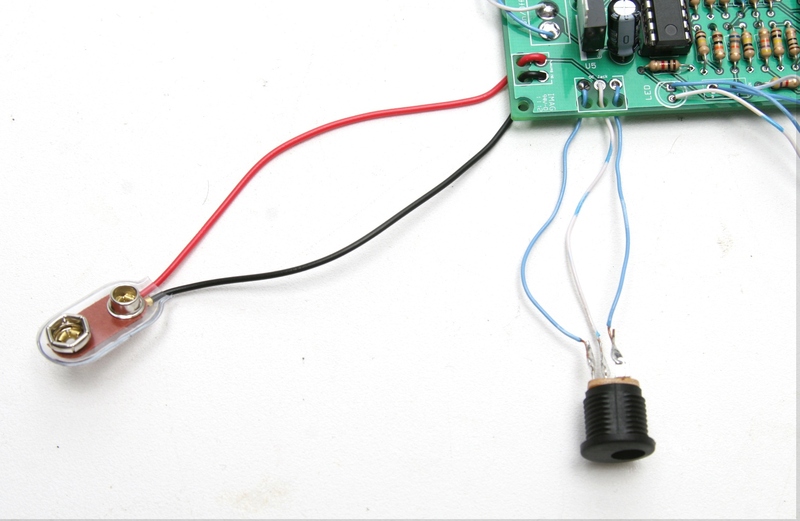 The 9V battery jack connects to the board with the red wire to the ‘+’ and the black wire to the ‘-‘. You may have noticed that I used colored wires throughout these instructions; this was intentional. Troubleshooting a malfunctioning circuit is 100% easier when you can quickly identify misplaced wires by visual inspection. Use one color and you will see exactly what I mean when you make a tiny mistake. If you do not want to install the 9V DC jack and only install the 9V battery clip you will have to short the S and C pins for the 9V DC Jack like shown in the picture below*. * Your PCB may not look exactly like the photo, that is ok. What is important is that you short the same pins as shown in the photo. Following the image below, you want to take one of the wire from the on/off switch and connect it to the S pin for the DC adapter jack and install an N4148 diode between the switch and the S pin for the DC jack with the black line on the diode being towards the switch. Alright! We are done building the DS-8 Clone Drum Synth! Now, let’s test our circut. 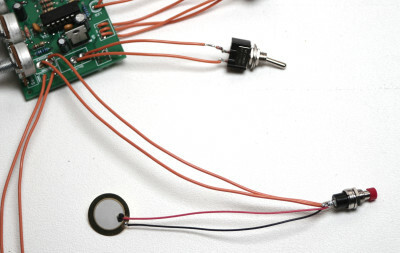 Turn all of the potentiometers to a somewhere-in-the-middle position. 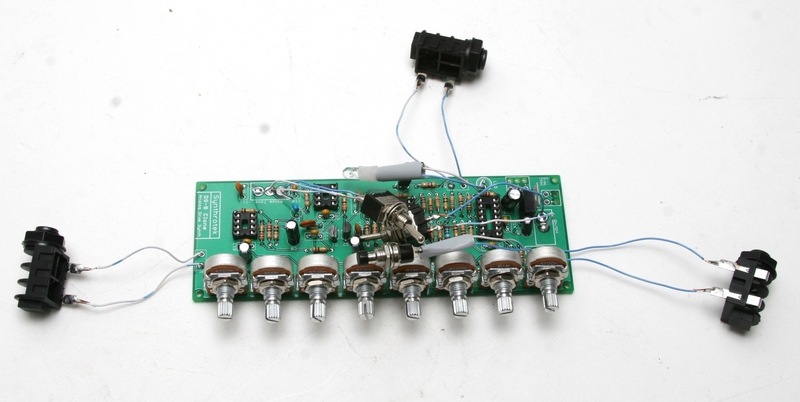 Insert a trigger source (Piezo Drum, 555 Timer Circuit, synth output, etc. )into the Trigger jack. 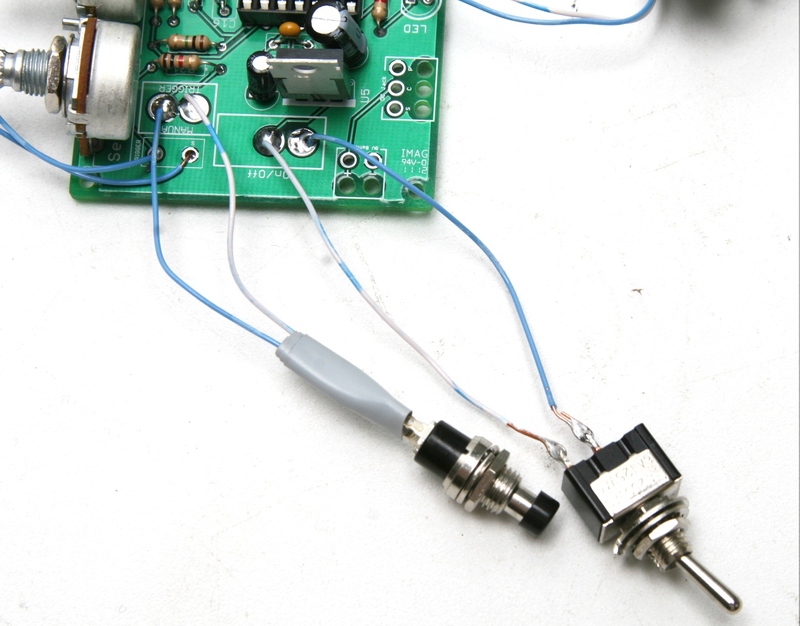 Connect the circuit at the Out jack to an amplifier with a 1/4″ cable. Do you hear anything? If not, adjust the Level and Sensitivity pots until you get a sound. Should you still hear nothing, switch trigger inputs. If you still don’t hear anything, go back through the instructions and double-check all of your component placement and wiring. When you finally get a sound out of all your hard work, take a break and bask in your success. Not everyone has the patience and skill to be able to create their own synths, so congratulations on a functional build! After you’re done playing around with your finished circuit (several hours later), take a quick look at the Mods section to add functionality or circuit bend your own circuit. There’s a lot you can do to make your own unique sounds. Thanks for purchasing a kit from us and we hope that you are happy with your circuit. If any of these instructions are unclear or you have a question, send us an email. 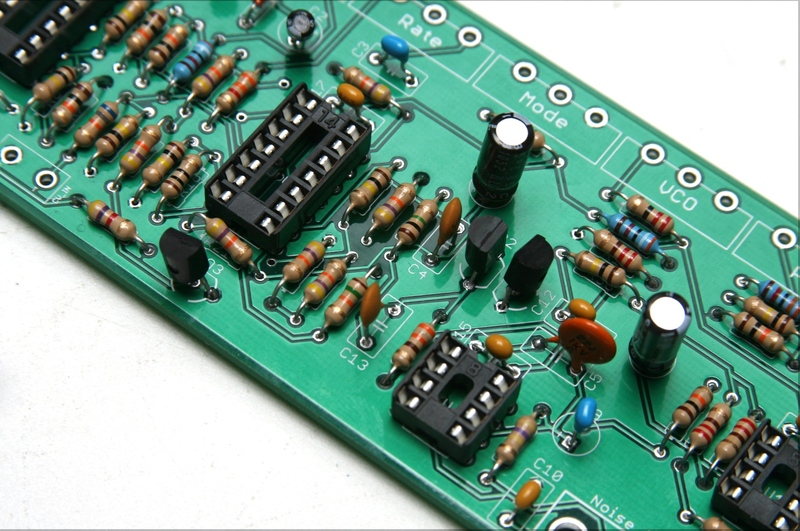 We like it when our customers build our circuits. Include detailed pictures if you are stumped on where the problem lies with your circuit. Any feedback we get helps to improve these instructions as well as help you past any stumbling blocks. i can’t see the polarity of the 1N4148 on your assembly instruction (D1,D2)? Both D1 and D2 should have a thicker line on one side. You want to match the thicker line with the line on the diode. If you still have trouble identifying the orientation of the diodes, first orient the board so that the potentiometers are facing away from you (Decay, Sweep, VCO, etc are at the ‘top’). The diode for D1 should go in with the line on the diode being to the right. The diode for D2 should go in with the line on the diode being to the top of the board. Hey, just curious, on the PCB C9 looks like it’s supposed to be an electrolytic capacitor, but on the BOM it’s a ceramic capacitor… Polarity, parts…. anything the matter with this? We had changed what value capacitor goes into C9 for a better sound but just have not updated the PCB design. A 47nF ceramic capacitor should go in there and you don’t have to worry about polarity. Thanks! I figured as much, but just wanted to make sure. The BOM asterisks addressed questions like these, might be good to add another one for C9. Hi, I’m having an issue assembling the PCB, and I was wondering, my package included a LM317 regulator instead of the LM7805 which the BOM and the schematics list. Are they interchangeable, or should I really have an LM7805? Sjoerd! NO! they are not interchangeable, must have been a kit error over here, many apologies, hit us up at synthroteksales@gmail.com and we will send you out the right part all speedy like. OK, thx. I sent an e-mail! Hello, ive just built the DS-8 from a kit and can not get any sound out of it at all, im using an 808 to trigger it but it wont work with the manual trigger either. I have built your nand synth and atari junk with no problems whatsoever plus a few other kits, I really took my time when placing components and have checked them all over again they seem fine, c11 had written on it 475, is this correct? The LED does not light up and it seems like no power is getting to the circuit, and the battery is fine. I can detect no solder bridges and all the ICs and diodes are fine. I think. I would very much appreciate any input you could give me please, Thanks. If there’s no solution there for you, try and take some high resolution up close pictures (not too up close where the camera gets fuzzy) and send them our way so we can try a visual inspection before we proceed any further. We’ll get you sorted. Thanks for your help, I have tried everything on your troubleshooting page and still no sound or sign of life. I wonder if it could be a faulty component on the PCB? but I dont know which ones are likely to affect the power. I have taken some photos of the PCB but not on an SLR camera, I hope these will be good enough if not I will try to get an SLR, where should I send them to? Sorry to be a pain and thanks for all your help. Hi Steve, thanks, I will send the photos over now, hopefully they will be of good enough quality, if not I will take some more on a different camera. just thinking about extracting the envelope decay and LFO signal. an output jack with this info would be nice for interfacing with other modular analog gear. i.e. controlling the pitches of other VCOS, filter cutoffs, etc. We are working on a more robust eurorack version soon. Good ideas! awesome.. i’d be interested in a kit that could be used with frac. So got to the end of this thing and I get the LED light on and a crackle of sound, but nothing else. I know you’re going to tell me to check all the connections, which I’ve done. The battery is new, etc. Anything else I can look for? I have a strange probleme with my ds8 clone : I have continuous sound when i switch on it, it’s like a dub siren – i can modifie sound with all pots. When i push the manual trigger button it cut sound, and sound reappears after few seconds (depends of the decay and sens. pots). ?? I don’t know what to try to change now to fix it, if you have any idea it will be great !! Thank you and i apologize for my poor language ! I’ve recently completed this kit but can’t get it to work. The battery is good and I’ve tested the circuit. Double checked components and everything looks good. Maybe I’m missing something obvious but I can’t seem to figure out the problem. The led doesn’t light up and the circuit appears utterly powerless – much like myself…ugh. I’m sorry you’re having trouble with the DS8 build. If you haven’t already, I would check out the troubleshooting guide over here. Component placement and cold solder joints are biggies, and with how many wires this build has, it’s even more so. If you’re still having issues, give us a holler at store@synthrotek.com and we can work out how best to get your ds8 working. Hello, The ac adapter is center negative? 9-15v? Thanks. Works great! A smidge noisier than my pals pr series percussion 888 space drum, but still very good. Correct, the ac adapter is center negative 9v. I’m glad you like it! Hey Patrick, I have been really digging my drum box. It has been very useful. Lately, I feel that the output volume is not what it once was. The sounds are the same but I gotta turn the volume to max. I am wondering if there is a schematic somewhere so I can do some trouble shooting. Thanks. Joe. Oooops. Found the schematics link. Doh. Can you tell me roughly the peak out put(V) I should expect to see? Thanks. Joe..
I’ve just built a this DS8 and also the Dec delay. I want to chain them together and power both from the same DC input. Could anyone suggest how I should connect the power for the delay from the DS8 clone? I don’t need to bother with a battery connector or even an on/off switch for the delay if the mix goes all the way down to 100% dry. Any help would be much appreciated. This is a great idea and a simple mod! From the assembly instructions, you’ll notice each build has a section where it tells you how to wire the DC Jacks. In this situation, I would solder two wires (make sure they are long enough) to each pin on the DC jack. Solder one wire of each pin of the DS-8 into the proper vias (P-C-S). Now with the three left over wires, go ahead and solder those to the Dev Delay in the proper holes as well. And that is it! You are splitting the current, but still providing enough voltage for both circuits to run. Battery life span, in this situation, would go down a bit, but if you’re using a wall jack it will be totally fine.